Spartan Apple This tree is an ‘Idaho Preferred’ Plant. Spartan Apple is highly aromatic, crisp, juicy, fine flavored, and an early maturing apple. Spartan Apple is a McIntosh-type dessert apple, but firmer. It stores well. This apple has pure white flesh and is medium sized with dark red skin. Spartan Apple likes to be planted in full sun. It is resistant to scab, mildew and fireblight. Spartan is a heavy bearing tree and is winter hardy to zone 4. It is self-fruitful, but a larger crop is produced if cross-pollinated by Lodi, or Liberty. Fruit trees attract wildlife, birds, and bees. They are good for fresh eating, making jams, jellies, sauces, and pies. 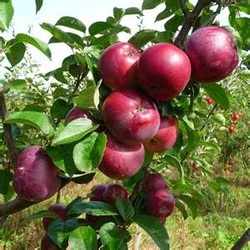 Spartan Apple can also be planted in a cottage garden.